In the release Creators Update (1703) for Windows 10 the in-built support of reading and creating multiple partitions on any USB storage device (no matter if it is a USB drive or disk) appeared. Previously, when connecting a USB stick with several partitions (e. g., created in Linux) to a computer running Windows, the system saw and could work only with the first primary partition. Normal operation with multiple partitions was available only for the drives identified as fixed (local). We remind that common USB drives in Windows are identified as Basic, while USB sticks and SD cards — as Removable. This feature is realized by checking RMB (removable media bit) on the flash controller. Earlier we have considered a way to substitute the controller response using Hitachi Microdrive (How to Make Windows Detect a USB Flash Disk as Hard Drive in Windows). Windows 10 Creators Update automatically shows all partitions on a USB stick ignoring RMB, and this device is still identified as Removable. Format it into NTFS file system and open Disk Management console. 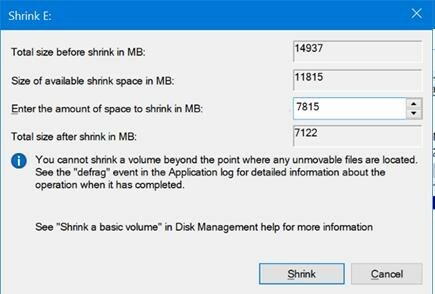 Right-click the partition on the USB stick and select Shrink Volume in the context menu. Specify the size of free space after shrinking and click Shrink. For example, we want to create two partitions of 7 GB and 8 GB on the 15 GB storage device. Right-click the unpartitioned space and select New Simple Volume to create another partition. As you can see, we have got the USB stick with two partitions, the file system of the first one is NTFS, and the second — FAT32. 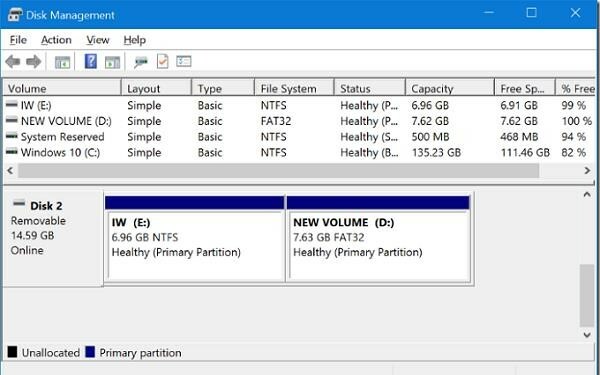 Both partitions are displayed in Windows and are ready to use. You should bear in mind that USB sticks with multiple partitions will be correctly displayed only in Windows 10 v1703 or higher. The earlier Windows versions will display only the first partition. Very helpful article. Well explained and straight to the point.